Thanks to Dusty from AsMomSeesIt.com for the use of this photo! I think my Million Dollar Arm review leaves little doubt that I'm a huge fan of this movie. It's not because I went to the Hollywood premiere, it's not just because I got to interview Jon Hamm, and it's not even because I met and interviewed JB Bernstein, Rinku Singh and Dinesh Patel. I even had the amazing opportunity to interview Madhur Mittal and Suraj Sharma, who play Dinesh and Rinku in Million Dollar Arm. But the reason I loved Million Dollar Arm so much is because it's simply a great story told with amazing actors. Two of those amazing actors are Madhur Mittal and Suraj Sharma. I've seen the movie twice, and, while I was impressed with their parts in the story during the first screening, I really noticed both of their brilliant acting skills the second time around. Not only are they both fantastic actors, both Mittal and Sharma are incredibly nice! 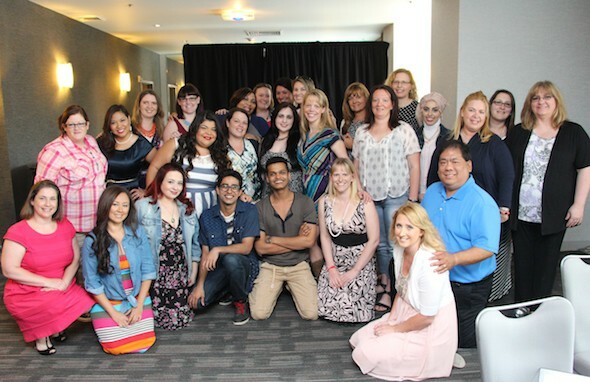 When my group of influential mom bloggers interviewed them a few hours before the Million Dollar Arm premiere, they were beyond gracious, sweet and funny in their answers to our questions. What compelled you to audition for Million Dollar Arm? MM: I think I speak for the both of us; what really hit me was that this is a tremendous feat that [Rinku and Dinesh] achieved and I had no idea about these guys. Nobody in my family knew. None of my friends knew this story. And what these guys have achieved is something that nobody has ever done in any sport in the history of mankind. That is big. So I was really kind of upset and I know for a fact that so was Suraj that…nobody knew about this story. I think it's very important that this story reaches people and that was the first thing that hit me. SS: It's just the fact that [Rinku and Dinesh] came from nothing and went and did something phenomenal. Nobody seems to realize that…they weren't really appreciated for what they did. MM: In a way, they're not applauded enough. SS: Exactly…the fact that I didn't know myself…it almost depressed me. It was like I was doing what everyone else [was doing]. It just leads you to think that their story really needs to be told and people really need to know this. Other than the fact that it was an amazing feat, it just gives you a sense that there's a lot out there that we don't really realize, opportunity-wise. The amount someone can work in a situation where they don't know what's going on and make something out of themselves? It's very inspiring. MM: I think it gave both of us a chance to showcase something different from what people have seen us do in our last films. I played a bad guy in my last film; [Suraj] played a completely different character. I think it's a great chance for us as young actors to portray something different and expand our spectrum as actors. SS: Absolutely not. Zero experience in baseball altogether. Yes. I twas quite hard. We had a lot of fun during training! MM: We didn't know anything and then we were going to try and get all this stuff under our belt real quickly. We had three and a half weeks to do whatever we could do. We had our coaches flown down from the states and we used to have four hours of baseball every day. We are both quite scrawny boys, still very thin. So we had to put on a lot of muscle. We trained for three or four hours every day, then rested an hour, then went to the gym for a couple of hours [all with] a strict diet. 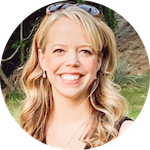 It was quite physically challenging, but it helped, because it's like a blank slate that [start] with, which is exactly what our characters were also going through…it helped understand the emotional parts. SS: I think we had a lot to draw from the fact that we were in the similar situation. Like we had a really short amount of time to prepare and then we had to perform on set. [Rinku and Dinesh] had 10 months of preparation and they had to perform, so it put us in a similar mind frame. Did you talk to the people you actually portrayed? What were one or two things that you pulled away from the people you portrayed? SS: The biggest problem was that Rinku has changed massively, tremendously, since the time period we were portraying. [Rinku] is so good at adapting that he's become a completely different person. So talking to him at this point doesn't really help me too much with all that we were trying to do. But Dinesh helped. MM: Dinesh was with us in Delhi when we were training for baseball and he hung out with us a lot, which was obviously great for me, because I portrayed him in the film. He also used to tell us all these stories and anecdotes of what happened when they were really going through all that we were portraying in the film. That would really give us a lot of insight into how Rinku was at that point in time or how JB as and how Aasif's character was. Just real insights into how these people were feeling when everything was unraveling in front of them. SS: That's a tough one. We actually had so much fun just every day. We were quite a handful; we were two young kids, so just give us a glove and ball, we would just keep playing all day long. They would have to drag us on set, but we had a lot of fun in a lot of scenes. It wasn't really while we were shooting that always made it special it was just literally the fact that everybody around us was having an extremely awesome time. It was the fact that all that added to the dynamic that hopefully was being set up in front of the frame. We were enclosed in like four walls and there was this huge ground in the middle. So we had no air flow and the sun was just beating down from the top with thousands of people in this small space. SS: It wasn't the hardest for us. Imagine those 300-400 [extras] standing there in the heat…and they had to act excited! MM: It's very hard and they don't even do it professionally like we do, so it's really hard. SS: But they managed to do it. Everybody pushed throuhg. There were a lot of times when stuff got really hard. MM: Jon [Hamm] probably changed his shirt like 20 times! SS: it was really hot, but people managed. Especially Jon [Hamm]. I feel like he's got this adaptive feature to him that you don't often see. MM: He's a bit Rinku in that way. How did you both get into acting? MM: There are very different stories for both of us. I have been in the business ever since I could remember. I started my career as a Michael Jackson impersonator as a child. Before I was three. I started with Michael Jackson and that's how I got into the entertainment business. When I was five my whole family moved…just so I could pursue a career in the arts. [I have] just a really amazing and supportive family. They struggled and really pushed for me, and I always wanted to be an actor, to be in the movies. SS: For me, I never wanted to be an actor, or anything to do with film. It was more of a realization. To some extent I might not have been able to do anything unless that had happened, but it just opened my eyes to the fact that…there is something here that I actually love a lot. And that's how it began. MM: It's very liberating to be on a film set. As a child, I was very shy, a complete introvert. Not the kind of person I am today at all. Even then I remember that I wouldn't be able to answer questions to people or just be very communicative, but when I was on stage I was a different person. That's when I felt the most confident and the most alive, and I felt that this is what I was meant to do. This is where I'm meant to be. I'm sure Suraj feels the same way. SS: Same way. You're surrounded by so many weirdos who are trying to make something out of nothing and I love it. They are full of passion. I mean it in a very positive way. You'd be crazy to want to work on a film or movie because of the ours, the amount of work, the amount you have to give to it. MM: The amount of creative egos at work at the same spot. SS: There's a lot happening and you want to deal with it, just because of the fact that you're making movies. You need to be crazy and I feel very much at home in that situation. MM: I think it's one of those businesses I'm very proud to be a part of. You accept people from all walks of life and there's just a tremendous spectrum of people from different cultures who look different are are just coming together and creating art. That's awesome. 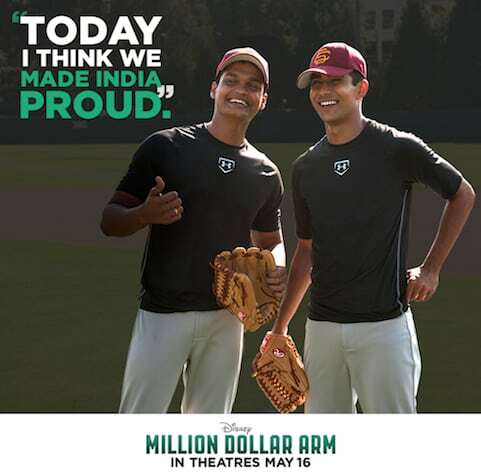 Disney’s Million Dollar Arm is showing in theaters everywhere. Find it in a theater near you and buy your tickets today! 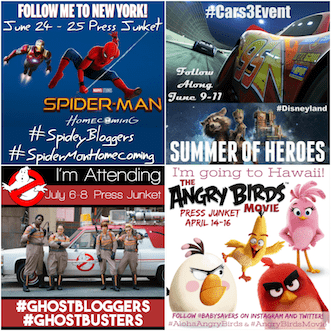 See all my Entertainment news or just the Disney updates.